Can humans and apes live side by side in harmony? That's the question proposed by the latest entry in the long-running Planet of the Apes franchise. Set 10 winters after the events of 2011's Rise of the Planet of the Apes, Dawn of the Planet of the Apes finds surviving apes Caesar (a motion captured Andy Serkis), Cornelia (Judy Greer), Maurice (Karin Konoval) and Koba (Toby Kebbell) in a primate's paradise, the woods north of San Francisco. They've created an entire society, complete with assigned roles and social hierarchy. Large sections of the human population have died off thanks to the same virus that made the apes intelligent. It's been so long since the apes have seen humans, many of them (speaking though sign language) wonder if humans still exist. They do, in fact, and a human colony has set up shop downtown in the City of Saint Francis. Human and Ape worlds collide when a human scouting party enters ape territory. It's a back and forth struggle as the apes attempt to show strength against the intruding humans, and the humans want to reactivate a hydroelectric dam in ape territory restore power in the city. Among the human camp, unofficial leader and ex-military man Dreyfus (Gary Oldman) argues with Malcolm (Jason Clarke) and his family about what the best course of action is with the apes. Dreyfus wants to use the weapons left by the National Guard to wipe out the apes, and Malcolm feels that a truce can be formed. The same debate is essentially played out on the ape side, and some of the more aggressive apes wish to wipe out the humans. Subplots involve fathers and sons, both ape and human. Just as Rise of the Planet of the Apes was an unconventional spectacle film, Dawn is an unconventional sequel. The main (human) cast of the former film is gone, the contemporary setting is jettisoned for a post-apocalyptic future and the action sequences are greatly expanded. Director Matt Reeves does a fine job with the lending gravitas to material that might otherwise be high camp, and the motion captured star creatures are some of the best CGI seen in cinema. Action sequences are thrilling in all the right ways. Yet somehow the camp inherent to the material isn't quite eradicated. At the end of the day, the apes get more characterization and while their concerns are indeed understandable, this reviewer couldn't shake the fact that watching a melodrama starring CGI characters (jaw dropping rendered as they may be) scowling and yelling at one another is just a little bit silly. Human society is not given nearly as much consideration as the apes', and Malcolm's medic wife Ellie (Keri Russell) is seemingly the only surviving human female. She is at the very least the only one with a speaking role, which suggests that electricity may not be human society's biggest problem. By hey, it's a Planet of the Apes movie, and the apes are delivered in spades. Well crafted and thoughtful, cinema goers who think they will like this film will probably be right. 2014 has delivered one quality big budget, spectacle film after another and this film continues the trend. 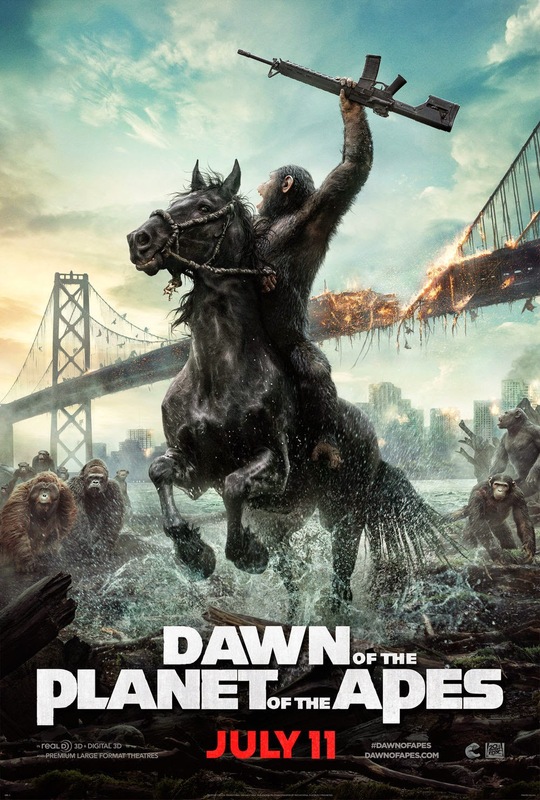 Dawn of the Planet of the Apes was written by Mark Bomback, Rick Jaffa and Amanda Silver and also stars Kodi Smit-McPhee and Kirk Acevedo.